Spiced Pecans for sale. Buy online at Zingerman's Mail Order. Gourmet Gifts. Food Gifts. Sharon Scott is a service star in our Service Center and a concierge in our Business Gifts department at Zingerman's Mail Order. 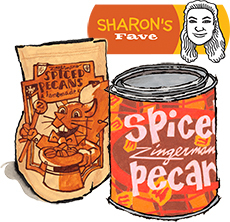 My obsession with Zingerman's Spiced Pecans is serious... I love how one seemingly simple food can be so versatile! Toss a few over fresh greens and your salad instantly becomes more sophisticated. Pile a few on a cheese plate and your dinner guests will gobble them with delight. You can even jazz up breakfast by stirring some into your oatmeal or muffin batter. However, most often, you’ll find me snacking on them right out of the package. The balance of flavors along with the crunch makes my mouth happy and the perfect blend of sweet and savory lightly lingers on my tongue long after my last bite. The warm, buttery aroma makes me think of Fall — my favorite season — and reminds me of my days living in Manhattan when the scent of freshly-roasted nuts would fill my nose with coziness and, for a brief moment, make the city feel like my hometown in the Midwest. Wanna put the great taste of our spiced pecans into your own culinary creations and baking? Check out our Spiced Pecan Dust.